The 22nd May saw the commencement of our Twinning weekend. This year, for the first time, Radyr Twinning members, 49 in all, ages ranging from 12 to 75, travelled independently by trains, boats, planes and cars to St Philbert de Grand Lieu, our Twin Town. Most people combined the weekend with a holiday in France, our first exchange without a coach. We arrived at the Salle de Maris early on Friday evening for a welcome reception and were greeted with warmth and affection by our French friends and the new visitors were introduced to their hosts We were then all whisked off for the evening by our host families, some of us met up again at dinner parties while others enjoyed quieter meals at home or were taken out to a restaurant. Every exchange has some event of cultural significance and this year we were taken to Nantes on Saturday morning to visit ‘La Galerie des Machines’ situated in a disused shipyard on an island in the Loire. This is home to the 50 ton wooden Elephant and other mechanical creations dreamed up by Francois Delaroziere. At the launch of Liverpool’s year of European City of Culture, a giant mechanical spider was part of the procession, and, by coincidence, it was made here in in Nantes. The spider is currently horrifying the citizens of Tokyo but the twice normal size elephant was at home in Nantes and this was a real treat. We were looking forward to a ride in the Houdah on its back which carries fifty passengers, but the atrocious weather that morning prevented the Elephant from taking its usual 40 minute walk. More than 56 square metres of poplar wood combined with steel ribs create the elephant’s sturdy body, hundreds of moving parts and scores of pumping pistons (22 in the trunk alone) with superb workmanship make this a sight to behold. We were given a tour of other crazy mechanical Loch Ness type creatures, where brave volunteers climbed up into the huge mouth of a giant mechanical Angler fish, or were tossed and splashed in a small rowing boat much as on the open sea. Others rode upon the back of the strange mechanical creepy crawlies. This was followed by a visit to the workshops where other monsters were being created. 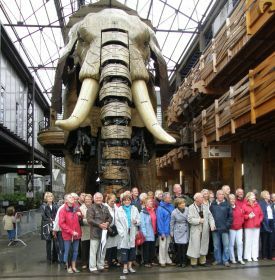 By this time the Elephant had moved to the hanger entrance ready to take visitors aboard when the weather improved and it towered above us as we posed for a group photo. We then climbed the first completed branch of the ‘Heron Tree’. This creation, when finished in 2014, will be an enormous steel tree which will be housed in one of the cities many parks. Visitors will be able to ride in baskets carried in the beaks of giant herons flying above the 35 metre sculpture. The foliage will come from 40 different countries and you will be able to walk from branch to branch. We then went off in various directions to explore the City of Nantes and to have lunch at one of the many delightful restaurants. Later we returned to the island and most of us were lucky enough to see the elephant walking with its flapping leather ears, deeply wrinkled eyes and the snaking reticulated trunk, from which, every now and then, jets of water were sprayed into the watching crowd or over the passengers. A few of us were lucky enough to get a ride in the late afternoon. Later that evening there was a lively Soiree, where a delicious meal was served washed down by gallons of French wine. Everyone present will agree that the hi-light of the evening was the surprise ‘Can-Can‘…performed by the French Twinning….eight energetic ladies gave us a few moments of delight, a very polished performance of high kicks, cheeky movements, the splits…the whole works… Wow!…follow that Radyr.